In this morning’s office meeting (I work at a small firm these days), someone brought up that September starts this week–say what?! Personally, I’m disturbed by this turn of events. Where did August go? Did someone steal it from me? And what did I do this summer? I guess I feel this way mostly because, for the first time since I was three years old or something ridiculous like that, I’m not going to school right now. Nope, no first day of class for me–and no immediate plans for it. Strange, this working thing. This every day is the same with slight variation thing. Growing up, it’s different, no? This weekend was rather low-key for us, unlike many of our friends’ and family members’ weekend on the east coast. Roanoke is just far enough inland that we only experienced a steady wind all day Saturday and some slight rain, but nothing enough to help the garden. My thoughts are with those without power and with other flooding/hurricane related damage. On Sunday, though, we finally checked out Paco’s Tacos, a tacqueria that opened a few months ago here in Roanoke. It’s on Williamson Road which is not exactly the nicest part of town, but the restaurant is close to downtown so it’s not too far out of the way, and at 2 pm there were a few others in the restaurant enjoying tortas and burritos. 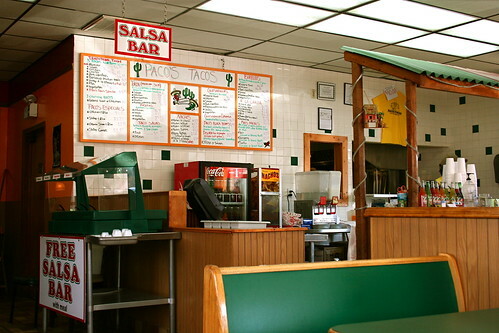 Decor-wise, it’s simple and semi-clean (the roll of paper towels on the table helped with the salsa left from a previous customer), and the menu features tacos, tortas, and some other gringo-esque items like burritos and quesadillas. G & I were hungry, but in between lunch and dinner, so we split three tacos: fish, carnitas, and beef tongue. Before the tacos came out, we were served a plastic basket of chips and we helped ourselves to the salsa bar offerings, dipping the chips mostly in the chipotle and the mild tomato-based salsas. There was also a green salsa (which I stay away from given my undesired aversion to cilantro) and that weird white sauce thing that I never knew existed before I moved here and I swear is really just mayo (ick). The salsa was fine, but nothing special and obviously just something schlepped from a mega can from some food distributor. Unfortunately the chips were old and the oil was rancid, so I ate one or two and then called it quits. As for the tacos–they were fine, but nothing special. They weren’t inedible but they weren’t the best I’ve had. The tongue was a little soggy and destroyed the tortillas it was wrapped in, the carnitas was good, but could have had just a touch more seasoning, and the fish was well seasoned, but strangely chopped into mealy bits. It wasn’t that Paco’s Tacos was a bust, just more like it wasn’t all that impressive–but, I have to admit, a good (and more authentic) alternative to Alejandro’s or the Tex-Mexy El Rodeo/Paso/Whatever-o that seem to be on every corner. 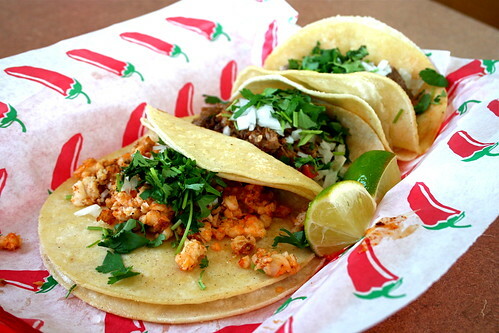 I’ve almost got my tacqueria experience from Atlanta and Texas and New York, soon, I hope it’ll be perfected. 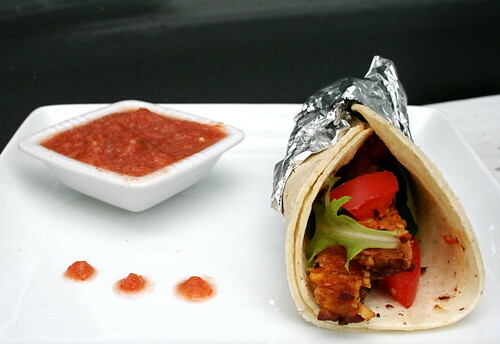 As for the Monday Archive, how about some Tempeh Tacos and my favorite Roanoke Mexican chef inspired Hot Sauce? I haven’t made these in over a year and I’d actually forgotten about them, but now I’m aching to whip them up again–and trust me, there’s nothing like homemade hot sauce to go with tacos. Fresh tomatoes are still around and my garden is bursting with jalepenos and serranos, so I’ve got no excuse. Taco night, I think it’s a’comin my way soon. Cut the tempeh into thirds, then cut each third in half width-wise to make nine equal-sized thin rectangles. In an 8×8 baking dish, mix the 1/3 c olive oil and Bragg’s together. Dredge the tempeh in the mixture and then place in the baking dish. Sprinkle the minced garlic and chili powder on one side of the tempeh. Let marinate for 4-6 hours, flipping over after two hours. After the tempeh is marinated, warm 2 tbsp olive oil in a large frying pan over medium heat. Saute the tempeh on both sides until lightly brown and crispy. Set aside to cool. Warm the corn tortillas in the oven or microwave. Slice the each rectangle of tempeh into 4 smaller rectangles. Use two tortillas per taco (double layer them) and place a small handful of greens in the tortilla, then layer three or four pieces of tempeh on top of the greens and sprinkle diced tomatoes on top. Serve with the hot sauce (drizzle inside the taco or dip the taco in the hot sauce). Whoa! Those tacos look great Jes! Well I might visit Blacksburg at some point this year–we’ll see! How were those beef tongue tacos?? I’m really curious to try them! Oh I am drooling. Those look RIDICULOUSLY GOOD! I love tacos, and the flavors you chose are strong but not too complicated. Just right to pack a powerful punch of delicious! Great pics, too. Oh, so this is why you were thinking about fish tacos! Do you ever toast your corn tortillas over a gas flame? That is totally my secret to the best of tacos, no matter what they’re filled with. Aversion to cilantro? Oh no! I love homemade tacos, but I think I might not be ready to venture into homemade hot sauce. I love the tacqueria-style foil around your taco. Yum!